This one of those true stories that will put a smile on your face. 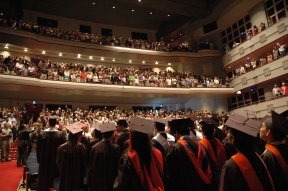 They walked in tandem, each of the ninety-three students filing into the already crowded auditorium. With rich maroon gowns flowing and the traditional caps, they looked almost as grown up as they felt. The speeches were nice, but they were routine; until the final speech received a standing ovation.